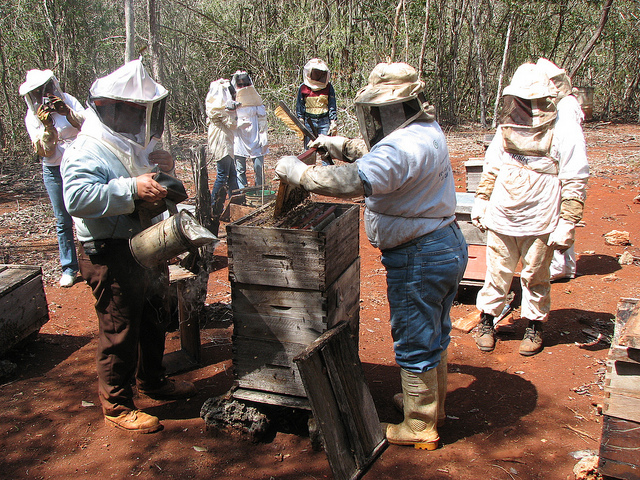 We began to work with Cooperativa Lol-Balché, a 41-member cooperative in Santa Elena, Yucatán in late 2006. In addition to selling wholesale, some members wanted to bring a percentage of their honey direct to market. This decision came at a pivotal stage in their growth and development with the completion of their state of the art honey processing plant. The objective of this direct-to-market project is to increase revenues from the sale of processed and packaged honey and provide viable economic opportunities in the community. This is especially important since so many residents temporarily immigrate to the the US to work. Driven in large part by the design project (the identity and label design), three cooperative members of the Unión de Asociaciones de Apicultores del Estado de Yucatán, have joined with Lol-Balché to bring their to market. The brand name of the honey is “Hach Kaab” which signifies authentic and real honey in Maya. The four cooperatives are situated across the state in Valladolid, Maxcanú, Majas, as well as Santa Elena. Their members, who number over 400 cooperative, their families, and their community will benefit from this design project when honey profits return directly to the communities. Honey is the complex substance made when the nectar and sweet deposits from plants and trees are gathered, modified and stored in the honeycomb by honey bees. Unique to Yucatán is Dzidzilché honey, which is a product of the aromatic flowers of the same name. Dzidzilché honey is highly fragrant, taking on the aroma of the flowers and one of the most sought after. Two other types of honey are Tajonal, which has a high sugar content, and Multifloral, which is combines the deposits from many native plants unique to the region. Beeswax: When honey is harvested, the wax can be gathered to be used in various wax products like candles and seals. Pollen: In certain environments, excess pollen can be collected from the hive. It is often eaten as a health supplement. Honey is also used in cosmetic items such as soaps, lotions and combined with other natural ingredients to provide nutritious sweets. The cooperative members of the Unión participate in various training courses throughout the year to learn new developments in the industry. Most of these courses are provided free of charge by state organizations and other non-governmental associations (NGOs). Each of the processing plants uses stainless steel equipment which is superior technologically for small producers.